This stylish apartment for 4 is located by the beach in Barcelona, in the Barceloneta neighbourhood. This area is well-known for its exciting atmosphere and is well connected to the rest of the city by public transport. 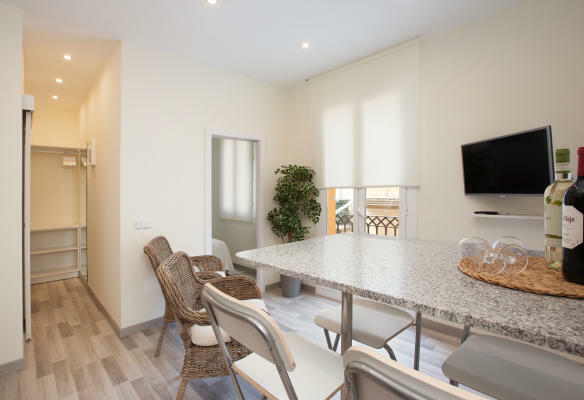 Both the metro station and Estació de França are located just a short walk from this apartment, and Downtown Barcelona is also just a quick stroll away. Surrounding the apartment you have a fantastic choice of bars, restaurants, cafés and plenty of supermarkets. This 2 bedroom apartment has 1 bathroom and can comfortably sleep up to 4 guests. There is a balcony from which you can enjoy the views of a typical street in the Barceloneta neighbourhood, which used to be a fishing village. The kitchen is fully equipped with everything you would need to prepare your favourite home-cooked meals, all in the comfort of this lovely apartment. There is even a dishwasher, washing machine, Internet connection and satellite TV. With air conditioning for the warm months and heaters for the cooler months in Barcelona, this apartment is the ideal home in the city.